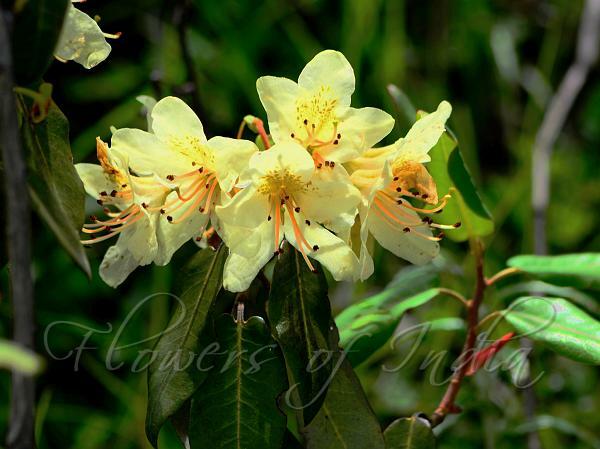 Three-Flowered Rhododendron is an evergreen or semi-deciduous shrub 1-5 m tall, with cinnamon colored flaking bark. Branchlets are minutely scaly. Leaves are ovate to lanceshaped, 3.5-6.5 x 1.5-3 cm, pointed, base rounded, green and hairless above, pale green or whitish beneath with minute scales. Leaf-stalks are 5-12 mm. Flowers are borne in 2-3-flowered. Flower-stalks are 7-12 mm, scaly. Calyx is minute, obscurely 5-lobed, scaly. Flowers are strongly bilaterally symmetric, open funnel-shaped, 2-3 cm, pale yellow green spotted, sometimes with reddish blotches inside. Stamens are 10, filaments velvety towards base, oary scaly. Capsules are narrowly cylindric, about 1.3 cm. 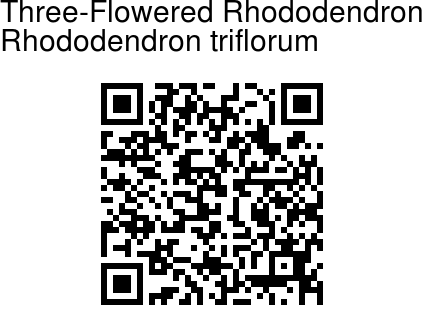 Three-Flowered Rhododendron is found in the Himalayas, from E Nepal to SE Tibet, at altitudes of 2400-3300 m. Flowering: April-May.